Your email list is one of the most important assets you have as a business owner. An email list can become a driving force to bring customers to your website. With the help of email marketing software tools like MyBizMailer, you can maintain any size email list you like, making it more effective at increasing customer loyalty, brand recognition and repeat customers. Are you ready to get the word out about your business? You know that email marketing is the way to go! But who are you going to send to? Learn how to create a new list by following the steps below. 2. Hover over the Subscribers tab in the Navigation bar. A drop down menu will appear. Look for and then click on the "Subscribers List" option from the drop down menu. A new page will load. 3. Click on the "+ Create A New List" button located at the top of the page. 4. A new page will load. Fill in the "List Name" field (be sure to name your list something that is relevant and meaningful for you). Fill in a brief description of this list to help you identify which list this is. Then click the "Submit" button. After you click Submit you will be directed to a new page that allows you to Import A Subscriber List if you already have one started. Congratulations you have now created a new list. You may find your newly created list by hovering over the Subscribers tab in the Navigation bar. A drop down menu will appear. 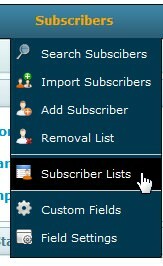 Look for and the click on the "Subscribers List" option from the drop down menu. A new page will load showing all the lists that are associated with your account.